Temperature is falling. Time to grill! Well… Anytime is the time to grill, but there’s something about those colder-weather grillings that are just a tad more special. I’ve been slowly slipping into soups-and-stews mode. Lots of homemade bread. But I also still have several steaks in the freezer that should be used before Memorial Day 2012. So tonight’s dinner was a s basic as basic can get – strip steaks, baked potatoes with sour cream, and green beans. Oh, and not pictured was toasted garlic bread made from the bread I made a couple of days ago. 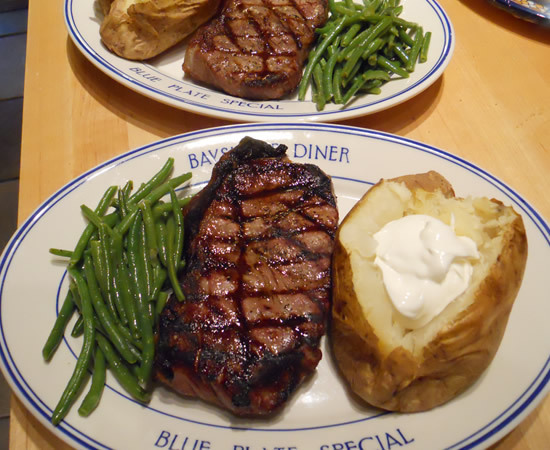 Nothing fancy, no exotic seasonings, just a good steak and a good baked potato – oven-baked, not microwaved. Bring on the weather. I’m ready!